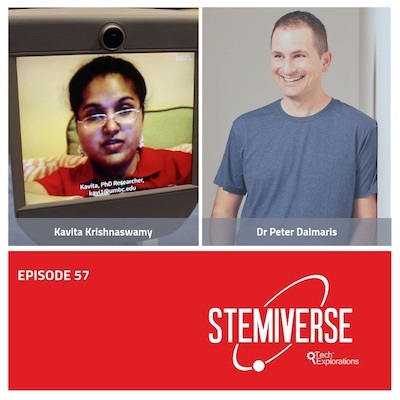 In this episode, Dr. Peter Dalmaris talks with Kavita Krishnaswamy. Kavita is a Ph.D. candidate in Computer Science at the University of Maryland, Baltimore (UMBC) working with Dr. Tim Oates. Kavita is a Google Lime Scholar and Microsoft Research Fellow. She is both a Ford Foundation Predoctoral and National Science Foundation Graduate Research Fellow. She’s also worked at the National Science Foundation’s Engineering Research Center – Quality of Life Technology Center (QoLT) in Carnegie Mellon and University of Pittsburgh and IBM Business consulting services. Kavita is a professional researcher with a physical disability. She’s motivated by a powerful, innate force: autonomy is the soul of independent daily living that she has achieved with the advancement of technology. Her research involves the development of robotic systems to provide assistance and increase independence for people with disabilities. She is developing several prototype robotic systems that will support transferring, repositioning, and personal care, with a focus on accessible user interfaces for control that are feasible for persons with severe disabilities (and this is the main topic of our discussion in this episode). This is Stemiverse Podcast episode 57. Stemiverse podcast is brought to you by Tech Explorations, a leading provider of educational resources for Makers, STEM students, and teachers. Go to techexplorations.com to see a complete list of our books and courses covering the Arduino, Raspberry Pi, and electronics. [0:35:51] What will home assistive robots be like in the future? [0:37:52] Based on Kavita’s experience during her school and college years, what were the current system’s successes and failures in supporting people with disabilities? How can things be improved? What technologies can be implemented? [0:45:11] Who has been the most influential in Kavita’s teaching and research?